Money buys peace for dictators. 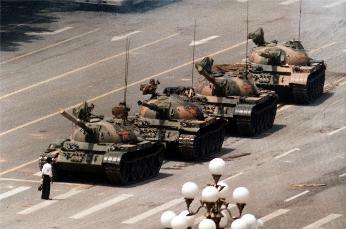 This week marks the 20th anniversary of an event symbolized to most in the Western world by the accompanying photograph: 1989's pro-democracy protests in Beijing's Tiananmen Square, and its subsequent crushing (literally) by tanks against unarmed students. This historic event involved tens of thousands of people, mostly students and intellectuals, who occupied the famous and photogenic square for seven weeks calling for change. Many of the beliefs of the protesters were consciously modeled on American traditions; they even went so far as to construct their own version of the Statue of Liberty, known as the Goddess of Democracy. For a heady month, it looked like Red China would follow East Germany and the rest of the Communist bloc into the light of freedom. It was not to be. The People's Liberation Army entered the square in full armored force, killing an unknown number of unarmed civilians and driving the remainder out. Leaders as well as ordinary protesters were arrested and executed. To this day, many of the most noted students involved live around the world in exile, and some still in China are reported to be imprisoned. Although the Communist Party did not fall, China didn't stay the same either. In 1989, China was just embarking on Chairman Deng Xiaoping's economic reforms, based on his famous saying that it doesn't matter what color a cat is as long as it catches mice. Deng realized that if he wanted for feed his people well enough for his nation to reach the power and glory the Chinese have always seen as rightfully theirs, economic development had to be Job One. He also knew that command-and-control was not an effective economic policy - they had tried government control of businesses several times before Mao Tse Tung was even heard of. In the intervening twenty years, China has turned from an impoverished Communist backwater to a land where, in the cities at least, capitalism reigns. A photo of Shanghai today looks just like such capitalist stalwarts as New York or Tokyo, only more so because it's newer. On Jan 6, 1941, President Roosevelt gave his "Four freedoms" speech in which he identified four essential freedoms - freedom of speech and religion, freedom from want, and freedom from fear. This went beyond the traditional "life, liberty and pursuit of happiness" which had been promised in an earlier time. China's economic performance is a tribute to its leadership opening up the nation, letting their people participate in the global economy, and letting them earn freedom from want. The strange thing about China's transformation, though, is that while Deng granted a tremendous amount of economic freedom to his people - to spectacular effect - the politics of China are almost as repressive as ever. Chinese have freedom from want, but they have no freedom of speech or of religion, and freedom from fear only insofar as they take care not to say the wrong thing or get in the way of the wrong man. True, there are at least rudimentary attempts to respond to popular feelings, as seen in President Wen Jiabao's astonishing public apology to travelers stranded in last year's snowy Spring Festival mess. Certain low-level posts are now filled by elections, but only members of the Communist Party may run for office, of course. These minor adjustments around the edges give the illusion of reducing the amount of fear felt by the average Chinese in the street, but there are still political prisoners: protesters are still as likely to wind up in jail as on the news, even when the Olympics is in town. Christians and Falun Gong feel the heavy hand of repression. The only one of Pres. Roosevelt's freedoms the Chinese government has seen fit to grant wholesale is freedom from want. Is One out of Four Enough? It's long been argued that increasing national and personal wealth inevitably leads to the newly wealthy demanding increased political rights. A little of this has happened in China, as for instance when the Communist Party decided to allow entrepreneurs to become party members, but by Western standards precious little. The Chinese have a fair amount of freedom in areas not deemed essential to maintaining one-party rule; but nothing really stops the Party from doing as it pleases save its own restraint. "Due process" simply does not exist although some courageous judges and lawyers are trying to act as if it did. Certainly there's nothing inside China resembling a free press or freedom of religion, and as far as contacting the outside world, well, they have the famous and stunningly effective Great Firewall of China. Of course a skilled computer geek can routinely pierce the Wall and browse whatever information he pleases; that's not the point. The government controls ensure that the vast majority of ordinary folks, who primarily care only about what goes on in their own personal lives, will never encounter opinions other than the ones the government wants them to have. Will the Chinese really stand up for their missing freedoms? ...It is now too late to retire from the contest. There is no retreat but in submission and slavery! Our chains are forged! Their clanking may be heard on the plains of Boston! The war is inevitable--and let it come! I repeat it, sir, let it come. Britain set out to crush the entire colony of Massachusetts into economic submission and drove them to lanuch an ultimately successful revolution. China's leaders have been far wiser. They crushed the students who were directly protesting - but allowed everyone else to continue following Deng's dictum that "To get rich is glorious." Wealth, or the promise of future wealth, buys a whole lot of domestic acquiescence and social peace, even while other liberties are being repressed. Who is more likely to rise up in armed revolt - someone whose livelihood has been stripped from him, or someone who has a comfortable and cushy life easily retained by a little self-censorship? The Chinese leaders hope that, having allowed China to become a first-world country, enough of their citizens will become fat, dumb, and happy enough to be content with a middle-class economic life and leave politics and power to the Communist party. The evidence suggests that most Chinese citizens are enough better off than their parents were to be content to avoid politics and leave government to the party. The risk for the party, of course, is that contentment may evaporate if the economic downturn lasts too long. The situation in the US is different. By offering Americans all four freedoms, the American government presided over the greatest sustained increase in material wealth the world has ever known. We've shown how many people who became extremely wealthy through the American capitalistic system have decided they'd rather purchase political power and support a government dedicated to ruling over the rest of the citizens than continue on the path of economic growth. Given the lessons of China, this may work out just fine provided that the government can keep the economy booming so as to maintain everyone in a state of economic contentment. Unfortunately, the Obama administration seems to have felt constrained to take over vast sections of the American economy. The Chinese are wiser - they know that government control of the economy doesn't work, having tried it several times before Karl Marx was even born. The manner in which many Americans have accepted loss of freedom in return for government handouts suggests that Americans, too, will be content to ignore politics so long as government can afford to pay them off. Unfortunately for the Democrat leadership, they're making a great many power-grabs which, if economic history is any guide, will result in shrinking the economy rather than building it up. What will happen if the American government can no longer afford to bribe its citizens to stay quiet? Is there some level of wealth where Chinese will stop worrying about economic growth and start to demand political freedom, and some level of loss of wealth where Americans will no longer be satisfied to be bribed with their own money? Are all four freedoms truly necessary to keep people from rebelling, or does freedom from want suffice? The lesson of Tiananmen Square is that peace and power for a dictatorship can be bought - if, that is, the dictatorship is generous enough with that one freedom. Mess with the money enough, though, and you're in trouble. The freedom from want is the best way to control a population. If keep the soma flowing few will ever question the rulers. The freedom from fear is demands the destruction of liberty and indeed the capitalistic system. For the fear of failure must be ever present, fear for ones job, fear for ones livelihood. Only through absolute control can a government prevent fear, but of course that always leaves fear of the government itself. The freedom of speech and religion are indeed important freedoms. To be economically free a society must provide people with the ability to succeed without taking away the possibility of failure. Life, liberty, and the pursuit of happiness was indeed the perfect expression of the important freedoms of man. The Romans did it by offering "bread and circuses." The Chinese need not offer circuses because the market provides sufficient entertainment, but providing sufficient bread to keep the mob happy eventually bankrupted Rome. The problem with raising taxes is that you eventually run out of worker bees and the hive starves.